Rabbi Arthur Nemitoff (center) with Alexander Oscar (left) and Father Samuil. Photo: Solomon Frances. The 75th anniversary of the rescue of the Bulgarian Jews is almost over. During the past days and weeks, the salvation was celebrated, while the 11,343 Jews from Thrace, Macedonia and Pirot, who were deported and murdered by the Nazis, were commemorated. During the anniversary events, countless guests came to Sofia, from Israel, Macedonia, Croatia, the United States of America and other countries. Ronald Lauder, President of the World Jewish Congress (WJC) came to Sofia. So did the organization’s Executive Officer, Robert Singer. There was another American guest who was not directly affiliated with the WJC: Arthur Nemitoff, Rabbi at the Congregation B’nai Jehudah in Overland Park, which is part of Kansas City. His attendance was not a coincidence at all. 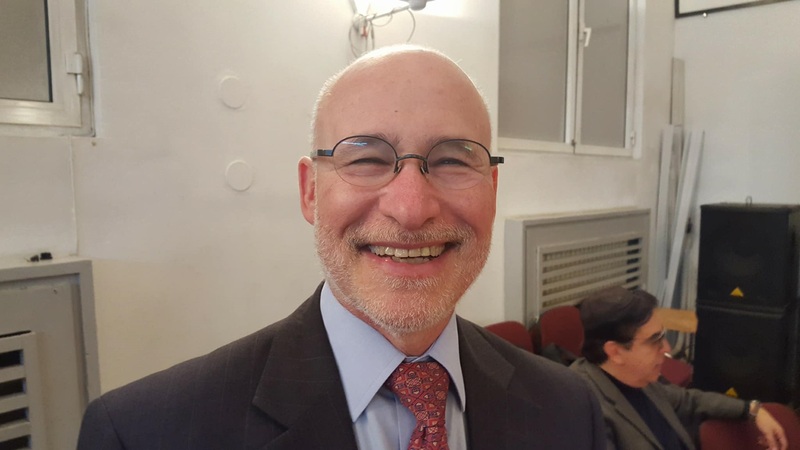 Rabbi Nemitoff has been to Bulgaria more often than almost anyone in the U.S.. The reason behind his frequent visits is the close partnership between the Jewish Federation of Greater Kansas City and Shalom, the organization of the Bulgarian Jews. 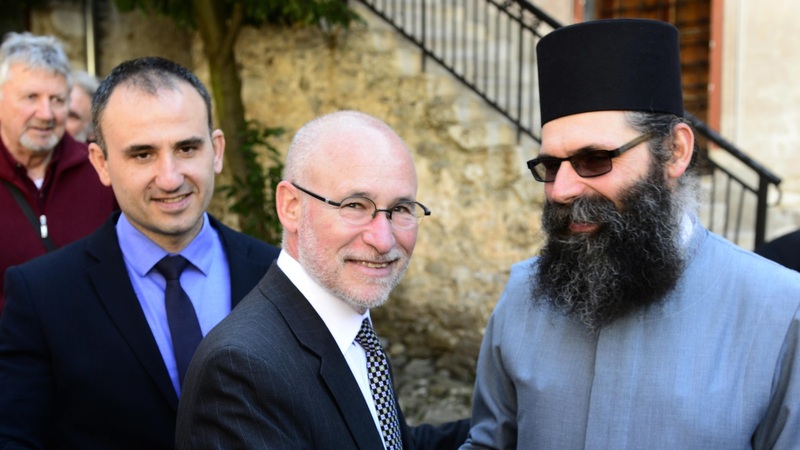 Rabbi Arthur Nemitoff just visited Bulgaria again. Photo. Imanuel Marcus. For two decades, there has been a frequent exchange, meaning Shalom members have traveled to Kansas City a lot, and even more Federation members have come to Sofia. In fact, the Kansas community has helped the Bulgarian Jews for a long time, and they still are. “In the world in which we live, where right-wing fanatics are spewing hatred and people seem to have forgotten the Holocaust, here is a government recognizing both the horror of the Holocaust and the goodness involved of those who saved the Bulgarian Jews. 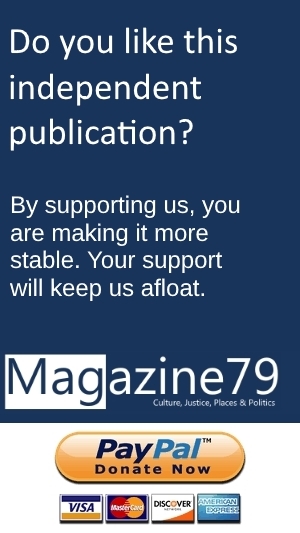 It moved me”, the Rabbi told Magazine79. 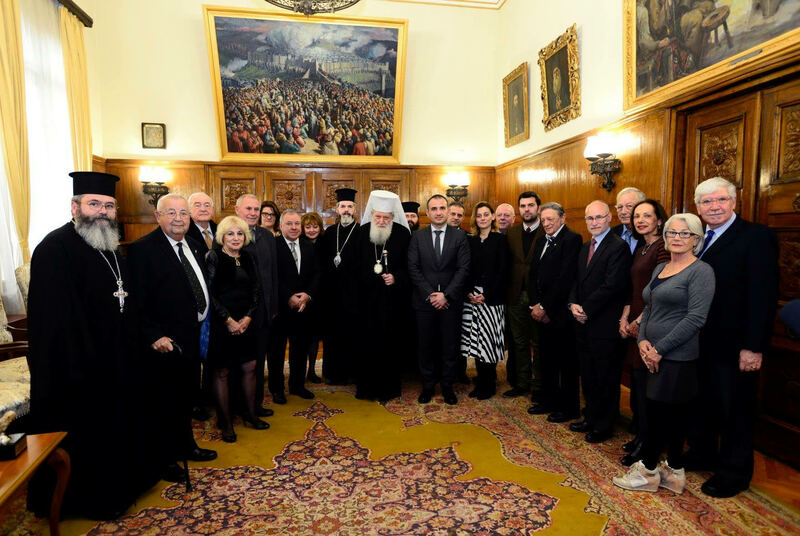 Rabbi Nemitoff (5th from the right) was part of a commemoration event at the Holy Synod in Sofia. “I am confident that Rabbi Nemitoff’s visit will have bestowed even more memories and impressions about the history and the present-day life of our community, and of the work being done through our partnerships, with the institutions of the national and municipal governments, along with other allies”, Dr. Oscar stated. “In turn, we cannot emphasize enough how his presence contributed to the sense that the significance of the commemorations is more than one that is about a community or a country, but one that is understood and appreciated by all our friends and partners abroad”, said Alexander Oscar, who has been involved with Shalom actively since he was a child. The Jewish community in Kansas City differs from the one in Sofia. The American partner community is almost four times larger, according to Rabbi Nemitoff. It has nine synagogues, while the Sofia community has one. Also the American community has far more facilities of different kinds. Of course the Sofia community is diverse too, with members of different backgrounds, generations and opinions. But it has one synagogue, which is an Orthodox one. Opening up a little, in this regard, is something many members endorse, while others do not. 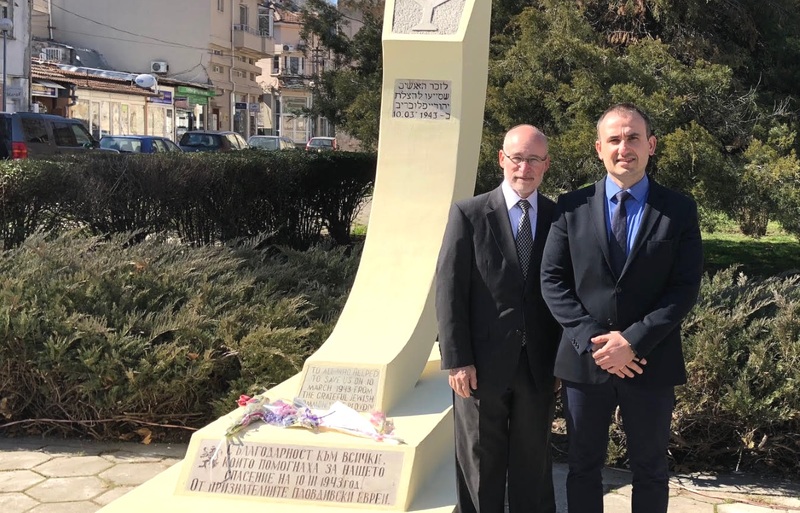 Rabbi Nemitoff and Dr. Oscar at a memorial in Plovidiv (Bulgaria). According to the Rabbi, there are two ideas which are still new to many Bulgarian Jews. One of them is volunteerism: “We rely heavily on volunteer efforts”, Nemitoff states. The other idea, which may not have prevailed, so far, is Tikkun Olam, which means healing the world’s brokenness. Nemitoff, a Reform movement Rabbi, says his congregation focuses on the latter a lot. Rabbi Nemitoff’s congregation and the Jewish Federation of Greater Kansas City have generously helped the Bulgarian Jewish community a whole lot, in many ways and for a long time. This includes the home for the elderly in Sofia and summer camps for children. Now, 27 years after the collapse of communism, that help is continuing. But, since the situation in Bulgaria has improved since, the way its Jewish community receives help is changing. “One of the things that we have spoken with Shalom about is the need for each member to contribute something. And I see that they are doing this in a variety of ways”, Rabbi Nemitoff indicates. Some 23 years ago, in 1995, Patricia Uhlmann, who was then President of the Jewish Federation of Greater Kansas City, came to Bulgaria for the first time. The situation then was very different.